I’m pleased to report to all Glamorgan 121 clients that I’m back on the road after a clean bill of health from my consultant. The Retail Distribution Review has arrived with little impact on the way Glamorgan 121 conducts business. We aim to give top quality advice regardless of whether you have £100 or £1M to invest. The markets are flying so let’s enjoy the moment as it won’t be long before the roller coaster starts all over again. 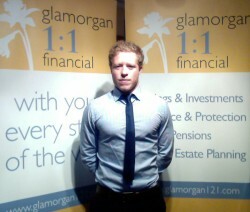 All Glamorgan121 clients have their own websites to monitor the progress of their investment and pension portfolios. Some of you now use the platform to keep an eye on your current and deposit accounts together with your mortgages and credit card bills. It helps to keep your eye on the ball if you are to achieve your long term financial goals. My son Gareth has now begun his financial services apprenticeship – his first of many examinations is in February. I have a lot of lost time to catch up on but aim to see as many Glamorgan121 clients as possible before the end of the ISA and Pension season. Please contact us if you would like a call.